China launched an 11,000-km new tourist route Saturday to help its vast western regions in the tough fight against poverty. The travel route links “three regions and three prefectures”, one of the hardest nuts to crack in the country’s poverty alleviation campaign: Tibet Autonomous Region, Tibetan regions in four provinces, southern parts of Xinjiang Uygur Autonomous Region, Liangshan Yi Autonomous Prefecture in Sichuan Province, Nujiang Lisu Autonomous Prefecture in Yunnan Province, and Linxia Hui Autonomous Prefecture in Gansu Province. On the route are cities like Lanzhou, Urumqi, Chengdu, Lhasa, Kunming and Xining, as well as tourist attractions including Dunhuang, Kashgar, Nyingchi and Dali. Plateau scenes, Mount Qomolangma, ancient trade routes such as the Silk Road and Tea and Horse Road are some of the highlights. 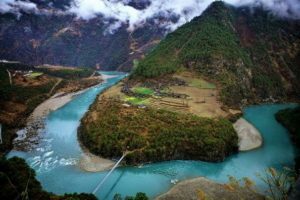 The post China opens new tourist route to help western regions reduce poverty appeared first on Mekong Tourism. Save 90% Off Flights Around The US With Frontier Sale!